Pollution disrupts an ecosystem most obviously when toxic chemicals kill plants and wildlife. However, even when a polluting chemical encourages growth, it can have a destructive effect on the delicate balance of an ecosystem. Some types of nutrient-rich pollution cause a swift increase in plant and algae growth; this is known as eutrophication. The resulting changes in pH and oxygen content can have a devastating effect on biodiversity. 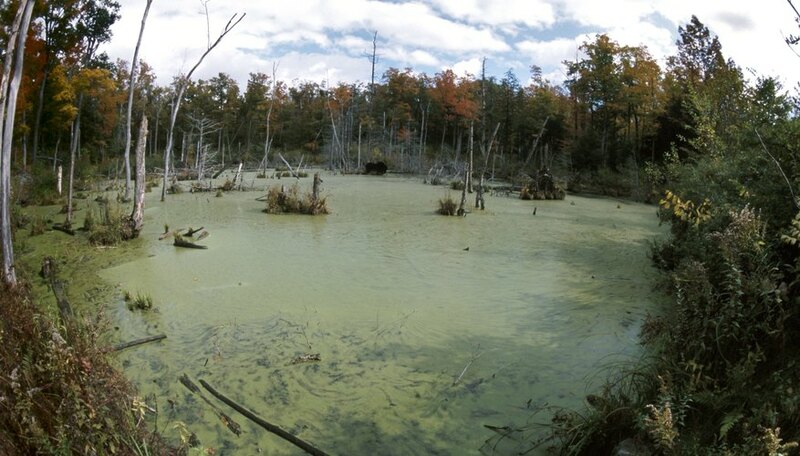 In a eutrophication cycle, a body of water receives an influx of natural or man-made chemical nutrients. These nutrients encourage rapid growth, particularly for simple algae and plant life that crowd the water surface. The photosynthesizing organisms outpace other animals and plants, dominating the ecosystem. The excess of simple plant life alters the chemical makeup of the ecosystem, killing animals and plants that cannot adapt to quickly changing conditions while encouraging population booms in a few plants and animals. As a result, the total number of different species living in the environment decreases, eliminating biodiversity and making the system less ecologically robust. Eutrophication begins when inorganic nutrients, primarily nitrogen and phosphorus, flow into a body of water. These chemicals can come from natural sources such as periodic flooding cycles in grasslands. However, most rapid rises in inorganic chemicals stem from human interference, including run-off from lawns or fertilizer manufacturers. The introduction of nitric and phosphoric acids make the environment a temporarily acidic nutrient haven for plant life. The simplest, fastest-moving organisms take advantage of this nutrient delivery most effectively. Photosynthesizing algae cover the lake or pond surface, competing for light. The chemical byproducts of this photosynthesis process increase the pH of the water, making it more basic. Delicate organisms that cannot survive under these chemical conditions will die, while hardier animals that feed on algae will experience population growth. As time passes, the inorganic nutrients are depleted and the algae begin to die. The dying algae drop to the bottom of the lake and decompose. Bacteria, which decompose this organic matter, leach oxygen from the water and produce acidic byproducts. Bottom-feeding animals that cannot handle the low oxygen content and low pH die, decreasing the biodiversity of the environment. MacIntosh, Mary. "How Does Eutrophication Affect pH?" Sciencing, https://sciencing.com/eutrophication-affect-ph-12036599.html. 25 April 2017. What Are Some Similarities Between Marine & Freshwater Ecosystems?